It is one of the top markets for luxury homes in the world: In the 2014 luxury report (you can download it here), Christie’s International Real Estate identifies Miami as one of the top markets for luxury homes in the world, rubbing shoulders with London, New York and Hong Kong. It is not anymore considered just a resort-market or vacation spot for a second home: According to Curbed, Miami’s urban market is now leading the way in luxury, amenities, and naturally, pricing. Projects such as Echo Brickell (our clients) with an average price of $1,869,472.00, and One Thousand Museum, with an average Price: $6,937,775.00 are just the beginning. 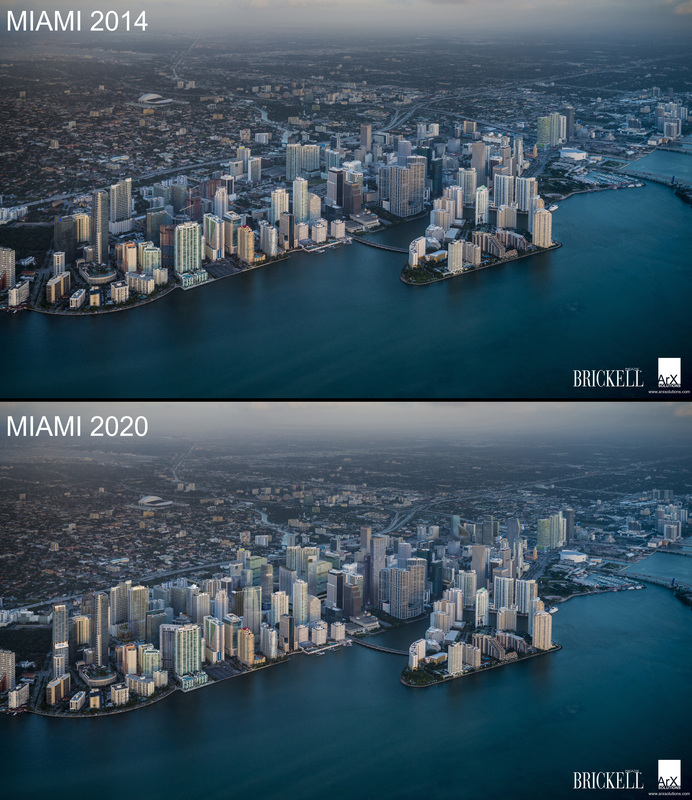 We don’t have to pay State Tax: This not so small perk will continue to make Miami an ideal place for the wealthy, which reflects also in the Real Estate boom. Its location: For us is simple, having an office in New York and another in Buenos Aires, Miami is the right spot to have our hub from where we connect to the rest of the world. Our Clients: Many of them are based here, and if not, for the reasons above mentioned have projects here. And even if they are out-of-town, who doesn’t want to spend a couple of days working in sunny Miami? Yes our offices are your offices, come and work with us here. We just love it! : Is there something not to love about Miami? We just haven’t found it. ArX renderings: Impossible to miss! If you drive on I-95, for sure you have seen these two huge images that we designed for our clients. Yes, everyone in Miami knows that ECHO Brickell and Muse are two new, fancy and sleek buildings that will make Miami’s skyline even more impressive. ECHO Brickell is a boutique residential high-rise in the epicenter of Miami’s fastest growing metropolitan neighborhood, located on the coveted East side of Brickell Avenue. Echo Brickell’s 180 state-of-the-art residences redefine opulent living in Miami’s most exciting locale. Muse is a boutique, residential high-rise located directly on the pristine white sand beaches of Sunny Isles Beach, Florida. The 47-story tower will offer only 68 oceanfront residences, including 2 and 3 bedroom units and full floor penthouses. And now you know that ArX Solutions was a key player in introducing Miami to these two new “kids in town”. Arx Solutions rendering designed for Muse. Arx Solutions rendering designed for Echo. Welcome to our Miami office! After 18 years in the real estate renderings and virtual tours market, we are very excited to show you our new headquarters in Miami. In the past two decades we have learned many things. One of the most important lessons has been to make our clients feel at home when we work together. Whether stopping by for a meeting to review a project or just to say hi and have a coffee, our home is your home. Coral Gables is one of the most vibrant and well-located neighborhoods in Miami, and we are there! Complementing New York and Buenos Aires, Miami is the center that not only connects our two other locations but our clients on 5 continents, mainly on the East Coast of the United States and the Middle East. Expanding our physical space allowed us to also grow our investment in technology. With 4 computers per person, this allows a faster rendering time for our client’s projects and a better response to meet the tightest of deadlines. We are now producing over 1,000 super high quality images and 30 virtual animations yearly. On our team of 30 artists we have Architects, Industrial Designers and Interior Designers who use all their expertise in the projects we develop. The Miami office is not only a reflection of the city’s multicultural diversity, but the result of our exhaustive search to recruit the best talent no matter nationality or geographical location. With an international team coming from the USA, Argentina, Brazil, Cuba, Egypt, Mexico, Russia, Spain and Uruguay, no wonder we speak English, Spanish, Portuguese, Russian, and Arabic among the many languages we speak on a daily basis. We are proud and happy to share with our friends and clients that Arx Solutions has grown 30% annually in the past 3 years. We especially want to thank you because WE have grown together. Our team is multinational and we are very proud of it. If you come to our building, you will be greeted here by our very friendly doormen. We enjoy Miami’s great light inside our offices as well. This is our meeting room. The great screen allows us to see our computers as well as the projects we present our clients. We try to feel at home in every corner of our main offices. Our offices have the great sunlight that Miami offers. We really feel confortable working in this new space. One of our favorite place for a coffee break. We love to pay attention to details. Our office is located in Coral Gables, in one of the most vibrant spots in the city. We have invested in the best software and hardware available to give the best service to our clients. Every project in which we participate gives us more inspiration to develop the next one. Come and feel at home in our new offices! In our offices you can find a team of 30 people in which we have architects, industrial designers and interior designers . We are always looking for the best talent no matter where we find it. With our new space we could invest more in technology to give our clients a better service. Do you feel like having some sun? It’s Miami! let’s work and relax for a while.